Pests that appear on lush new spring growth are eliminated or greatly reduced by properly applying dormant sprays now. They effectively kill the over wintering eggs of aphids, mites, most scales, plus many other pests and some plant diseases that are now in their most vulnerable stage. For most fruit trees apply a fixed copper or a lime-sulfur mixed with horticultural oil. For apricots use only fixed copper. The lime-sulfur may kill the apricot tree. *Seasonal spraying of trees is not included in our regular maintenance service. WHEN TO TREAT: After the leaves drop or just before the tender buds begin to swell and open. Avoid treatment just prior to rain as this will reduce its’ efficacy. Prune trees now, well before the buds and leaves expand. Roses need pruning in late winter once the buds swell and after the last frost. 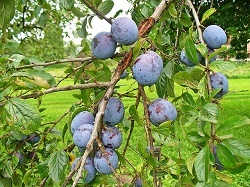 Fruit trees need pruning for maximum production. late winter and spring flowering ornamental trees and shrubs after they bloom in the spring. *Seasonal pruning of trees is not included in our maintenance service. Bare-root planting season is here! They should be planted now when the winter rains will help them become established before warm spring weather brings on a burst of growth. Plants to select include roses, apples, pears, apricots, plums, cherries, and peaches. Check availability of these plants at your local nursery or call us. Call us @ 805-544-5296 if you have any questions.